Writing a letter of intent or introduction, which is usually known as a cover letter will be easier if you implement these strategies. Don’t send a resume without a letter of intent, even if a person you know tells you that companies don’t read them. To achieve results with your job search submit a compelling letter to show your personality, passion, and value to an organization. These letter of intent writing strategies will directly affect the message you deliver and determine if the reader wants to read the resume. Make sure the message generates the right impression. If you are writing an executive cover letter make sure you include top-tier accomplishments to target the level of position you are applying for. The following cover letter strategies, techniques, advice, ideas, formats, etc. should ensure your letter complements your resume to land job interviews. Cover letter writing doesn’t change from country to country, so these tips apply to Canada, the United States (U.S.), Europe all over the world. Follow the best practices below for writing a letter of intent, and you will understand how to communicate your thoughts and show how you will benefit the company. It is vital to show employers how you can fix their problems and overcome potential challenges. With the following advice, you can make your letter look and sound better. If you are still not satisfied with it or need a critique, let us know. 1. Let your passion, personality, and energy shine through your words when writing a letter of intent. 2. Include a few relevant accomplishments to show your value to capture the reader’s interest. Ensure the wording is different from how you worded that achievement in your resume. 3. Write each cover letter separately, even if you use a prototype. Personalize each letter you submit with a sentence or two designed to reflect a sincere interest in the employer. Selecting the correct format will depend on the situation. Understanding the difference between a broadcast, general, targeted, networking, or recruiter letter will be important to your job search. 4. Check and recheck for accuracy in spelling, punctuation, and sentence structure. 5. Express your capabilities with confidence, but don’t exaggerate. Two part-time jobs at a department store do not constitute ‘extensive’ retail management experience. 6. Use natural language in simple, direct, and clear sentences. Don’t try to impress the reader with unusual vocabulary or complicated sentence structure. 7. Show the employer that you’ve done your homework and have a genuine understanding of the organization’s needs, mission statement, and business philosophy. 8. Be sincere in your praise, but don’t overdo it! 9. Make sure your cover letter is professional and business-orientated in appearance. Use standard business letter format on stationery matching your resume. If sending a letter via email, there are other things to consider. 10. Always write the letter of intent to the particular individual, if possible, who is responsible for filling the position, rather than a human resource official. Be sure you spell the person’s name correctly. 11. Whenever feasible, use networking resources (industry contracts) to introduce yourself in the opening paragraph of your letter of intent. 12. Finish with a strong closing statement indicating the action you desire. Take the initiative to request a job interview and state your intention to call in a week or two. If you mention in the letter that you will call, make sure you do. Many job seekers state that they will call, but never do. A company hiring authority may see if you do what you say. 13. Keep copies of everything you send, and follow-up according to your stated intentions. Don’t underestimate the power of following up on our submission. 14. Make yourself easily available and explain to employers how to reach you. Provide a number that will be answered either by a person or by your voicemail. Ensure your voicemail greeting message is professional. 15. Include a professional email address, don’t use your pet name, or I am a party-animal email address. 16. Mention appropriate activities, honors, and unique skills. If they are relevant, they can demonstrate skills employers are looking for, such as leadership, organization, critical thinking, teamwork, initiative, or other abilities. 17. 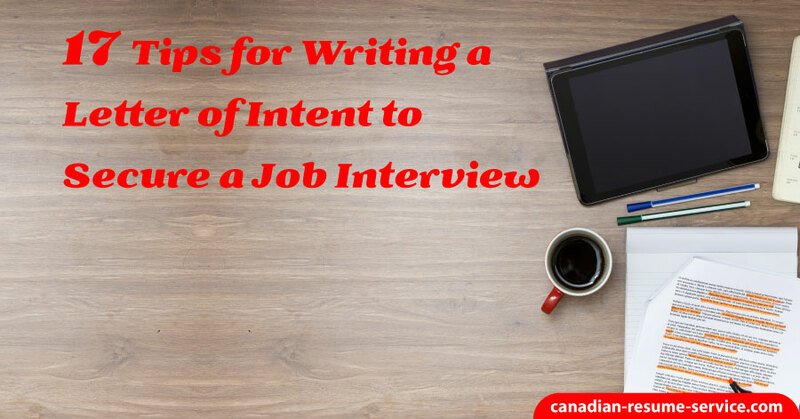 Don’t forget to sign the letter of intent and package it nicely with your resume that will grab the reader’s attention for all the right reasons. Check out our cover letter samples for further ideas about writing a letter of intent to get job search results to deserve.